200 pages, 5.5" x 8.5"
The tap's run dry, the supermarkets have been ransacked, the power is off and the low rumble of tanks can be heard in the distance. The unprepared who refused to believe that such a thing could happen here will live as wretched refugees—if they live at all. But for the prepared—for the city survivors—life will go on. America's leading survival author debunks the myth that the only way to survive is to stock a retreat in the mountains. 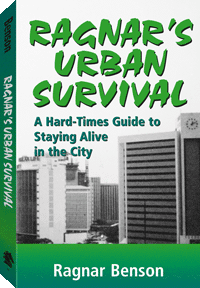 He tells urban dwellers how to find water; trap and butcher game; preserve food; position a retreat for maximum safety; avoid troops; and barter with other survivors. You'll learn which weapons are absolute necessities and which aren't worth having, and confront the all-important topic of survival nursing care. Ragnar gives you the solid information you will need to make it if the worst-case scenario becomes a reality.